Lake Kivu is one of the Great Lakes of East Africa which lies on the border between the Democratic Republic of the Congo and Rwanda. It is in the Abertine Rift, the western branch of the East African Rift and empties into the Ruzizi River which flows into Lake Tanganyika, southwards. Kivu means `lakes’, in some Bantu language like the words Tanganyika or nyanza. Lake Kivu which is located 100 miles north of Lake Tanganyika is at the highest point of the East African Rift Valley and is one of the three known volcanic lakes in the world containing high dissolved amount of carbon dioxide in its deeper waters, while the other known volcanic lakes are Lake Nvos and Lake Monoun in Cameroon. 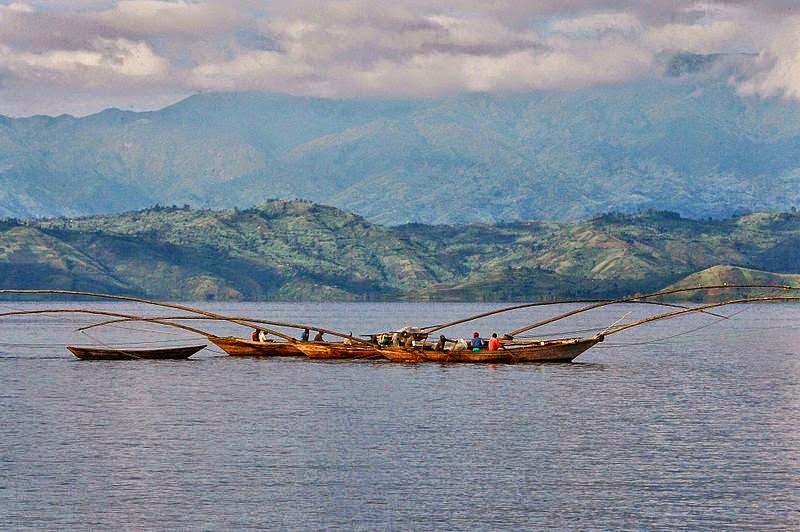 Lake Kivu is a fresh water lake together with Cameroonian Lake Nyos. Lake Monoun is one the three which experience linmic eruptions and surrounding the lake, geologists found evidence of massive biological extinction of about thousand years which was the result of outgassing events. In the case of Lake Kivu, the trigger for lake overturns in not known but it is presumed that volcanic activity could be the cause. The gaseous chemical composition is unique to each lake and in case of Lake Kivu, the methane as well as carbon dioxide is due to lake water interaction with a volcano. The estimated amount of methane is around 65 cubic kilometres – which if burnt over a year, it could provide an average power of around 100 gigawatts for the entire period and the carbon dioxide is estimated to 256 cubic kilometres. Methane is reported to be produced due to microbial reduction of the volcanic carbon dioxide and the risk from a possible overturn of Lake Kivu would be dangerous, dwarfing other lake overturns at Lakes Monoun and Nyos with around two million people living in the lake basin. The shores ofKivu are densely populated, Bukavu and Goma in Congo being the principal towns and Gisenvi in Rwanda. Count Adolf von Gotzen, a German explorer, was the first European to visit the lake in 1894. Though the lake is supplied with fish, it is poor in fauna but rich in volcanic substance with great volumes of dissolves methane gases existing in its deep waters, which could be utilised as energy sources. Lake Kivu has remained untouched for thousands of years though in the last few years it has drawn the attention in the scientific field where a heat flux in the lake or other meteorological and limnological forces could cause an overturn or perhaps later, rollover of the lake thereby releasing dissolved carbon dioxide from pressure causing discharge of gas which could be harmful to the communities located in the surrounding areas of the lake.